The development over the past few years has shown that gene therapy has become a true perspective. 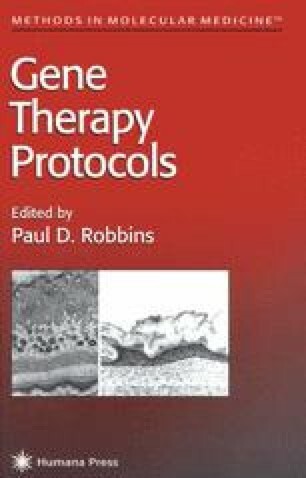 By January 1994, 63 clinical gene therapy protocols (gene therapy or marker studies) have been reviewed and most approved by U.S. control committees. Of these, 13 aim at inserting and expressing cytokine genes in tumor cells in order to use such gene-modified cells as vaccines in cancer patients, This idea is based on mouse experimental models that showed that tumor cells transfected with a variety of cytokine genes were rejected in immunocompetent animals. Tumor rejection induced by the locally produced cytokine results from an inflammatory response at the tumor site. Several observations are remarkable: the high efficacy of local cytokines to induce an antitumor response in the absence of systemic toxicity; a surprisingly large number of cytokines possess antitumor activity in this assay (IL-1, IL-2, IL-4, IL-6, IL-7, TNF, LT, IFN-γ, MCAF, G-CSF, GM-CSF, IP-10); and in several models, cytokine-producing tumors were heavily infiltrated by T-lymphocytes that contributed to tumor destruction (for review see ref. 1). The latter observation is interesting because T-cells can most specifically recognize and destroy tumor cells and are critically involved in tumor immunity Consistently, in several tumor models, mice that were immunized by cytokine-gene transfected tumors also rejected the nontransduced parental tumor and occasionally were able to eliminate small preexisting tumor loads. Tumor immunity was dependent on T-cells. Thus, cytokine gene-modified tumor cell vaccines are thought to trigger a local immune response in cancer patients, which is directed against putative, so far unknown tumor antigens and which are effective against residual (presumably small) tumor loads (e.g., micrometastasis). It is important to note that these genetic approaches to cancer immunotherapy are the beginning of a developing field and still have to address some unresolved problems such as inappropriate presentation of tumor antigens by the tumor cells, tumor-induced immune suppression, tumor heterogeneity, or the question as to whether they are more effective than the previous attempts of immunotherapy. Currently, three cytokine gene therapy variations with IL-2, IL-4, TNF, IFN-γ, or GM-CSF genes are tested: transfected autologous tumor cells; transfected allogeneic tumor cells; and transfected autologous fibroblasts mixed with tumor cells as vaccine. In most cases, the cells are irradiated before injection. Results from these initial clinical trials do not exist yet.